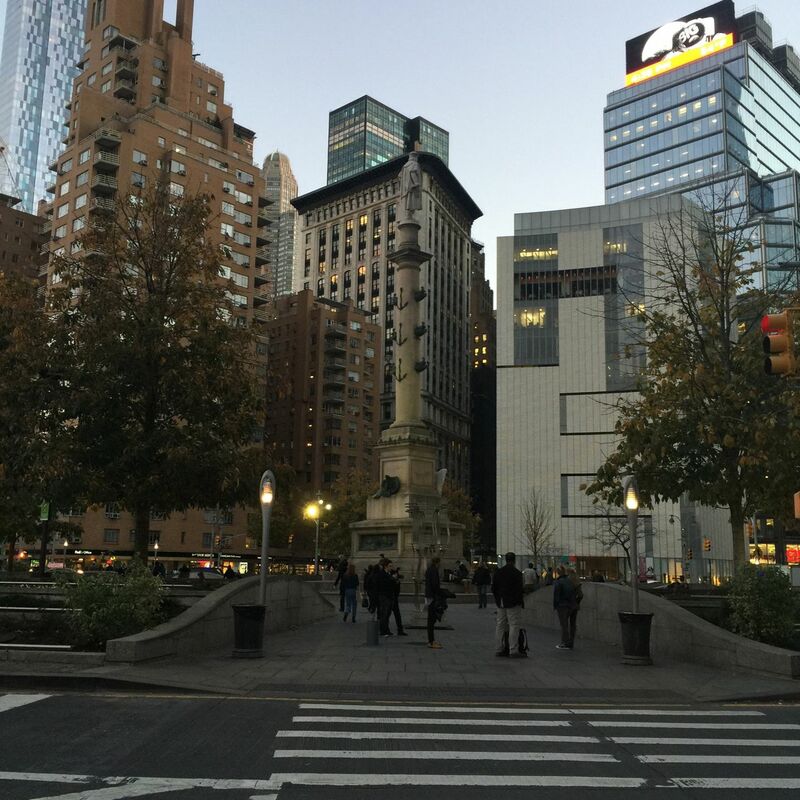 For uptown residents, especially on the West Side, Columbus Circle serves as an entry point into "the city." A trip on the A train from uptown at 207th Street to W. 59th Street, from bucolic "Upstate Manhattan" to the busy metropolis, takes about 30 minutes, a fairly convenient commute even by New York standards. The area near W. 59th St. and Central Park West features some of New York's most posh stops and restaurants (Per Se and Jean-Georges are here, for example), but beyond the glitter, everyday shopping happens here, too. 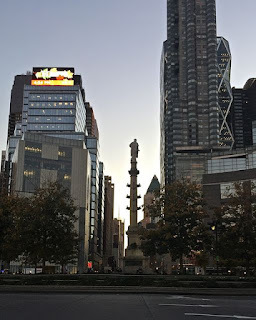 The best parts about living in New York, such as proximity to great centers of arts and music, are within easy walking distance of Columbus Circle. 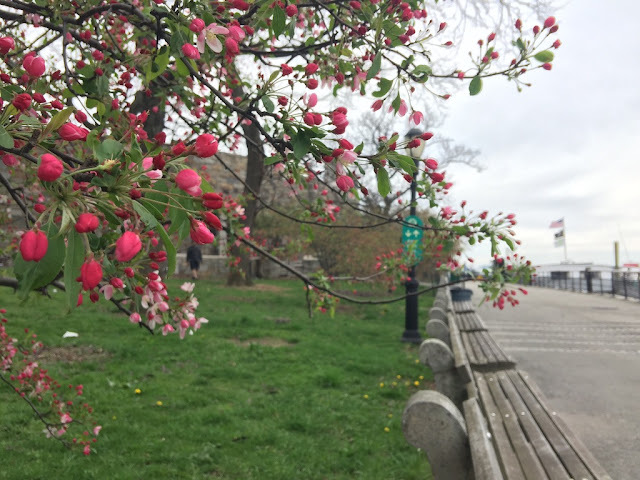 In addition, the southwest corner of Central Park is an excellent starting point for a walk in any season, convenient to the Heckscher Playground to the north and the Sheep Meadow beyond, and to the Hallett Nature Sanctuary and the Pond to the east. 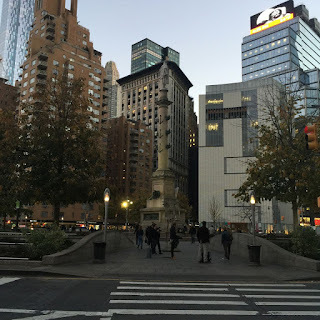 For a quick roundup of many NYC attractions, explore the streets in and around Columbus Circle. 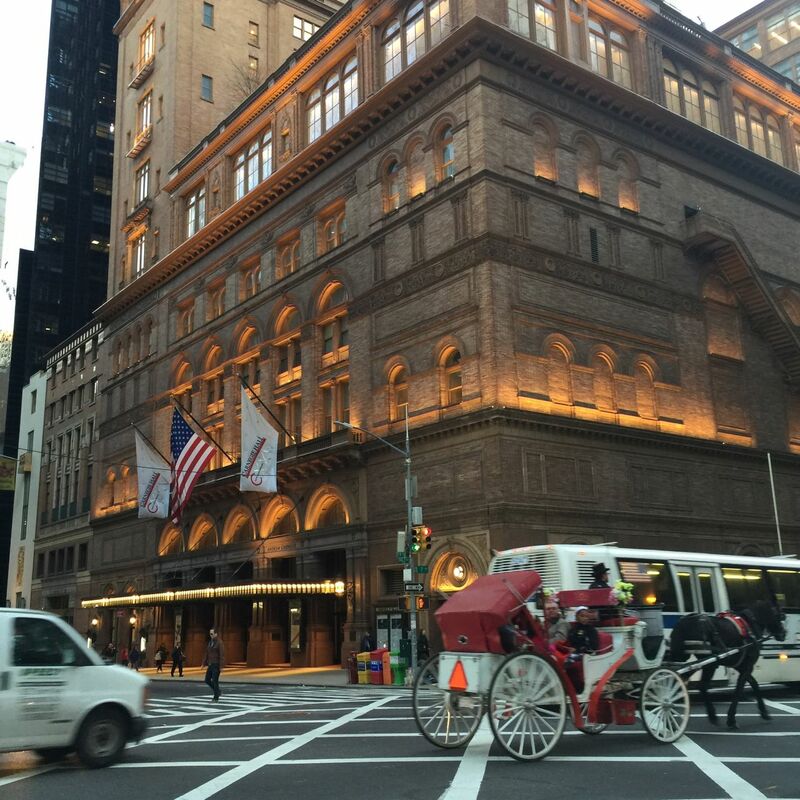 Walk south on Broadway and later to the north (or vice versa), with side trips along the way. The images below correspond to a walk on a recent late afternoon. The walk concludes at dusk. 1. Ed Sullivan Theater, The Late Show with Stephen Colbert, 1697 Broadway between W. 53rd and W. 54th. A quick glance down Broadway from Columbus Circle indicates the proximity of "Broadway," and all that entails. From Columbus Circle, it's just a quick walk to the theater. 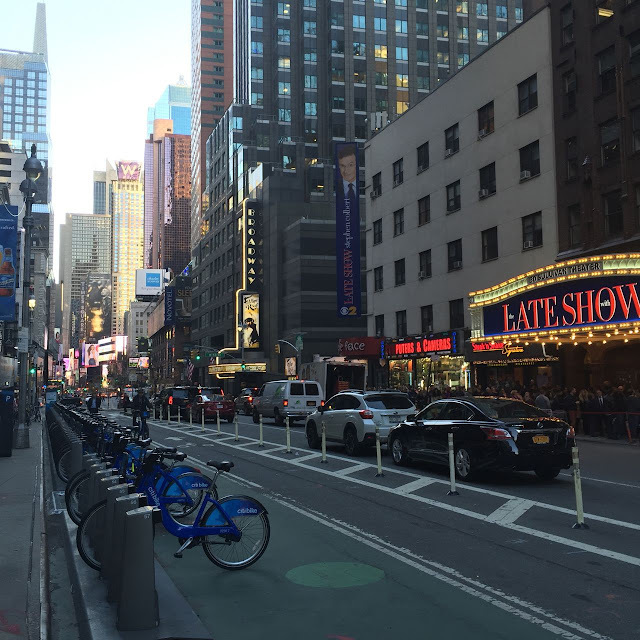 Here, late in the afternoon, a line gathers for a taping of the show. 2. 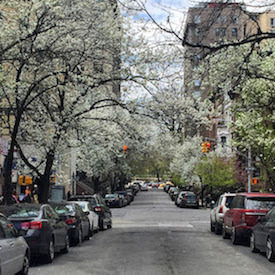 6 1/2 Ave., between W. 51st and W. 55th St. 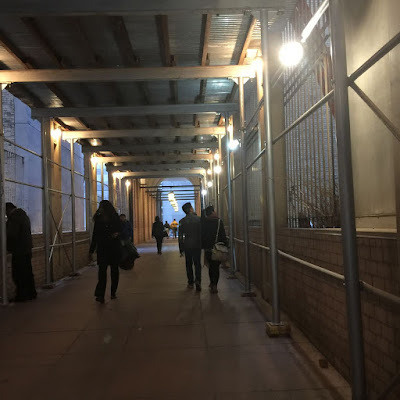 The "avenue" between Sixth and Seventh Avenues consists of a series of pedestrian arcades that run north and south between W. 51st and W. 55th St. The walkways make getting around this area fun and easy. This arcade near the City Center is getting a makeover. 3. 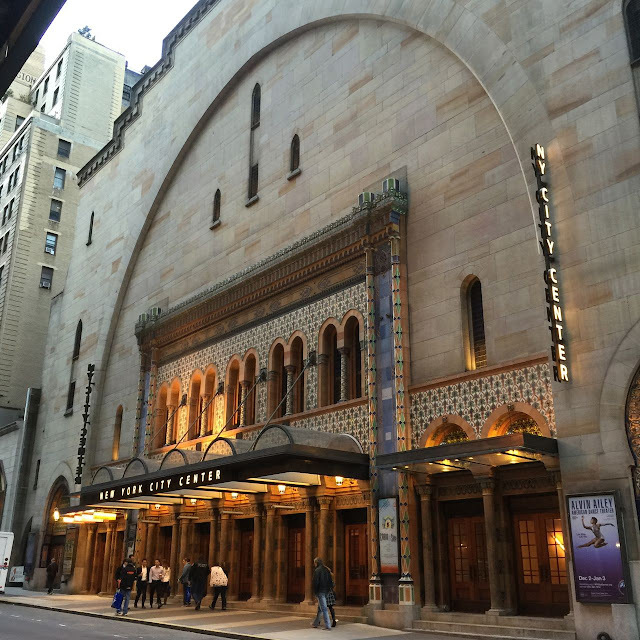 New York City Center, 131 W. 55th St.
A well-known venue for the performing arts, especially dance, the building on W. 55th St. is quite photogenic with its fanciful Moorish design. I've always admired the marquee lighting here. City Center was originally erected in 1923 as a meeting place for the Shriners. 4. Carnegie Hall, 881 Seventh Ave.
Once a vibrant corridor of culture, W. 57th St. has recently lost some of its cultural capital. 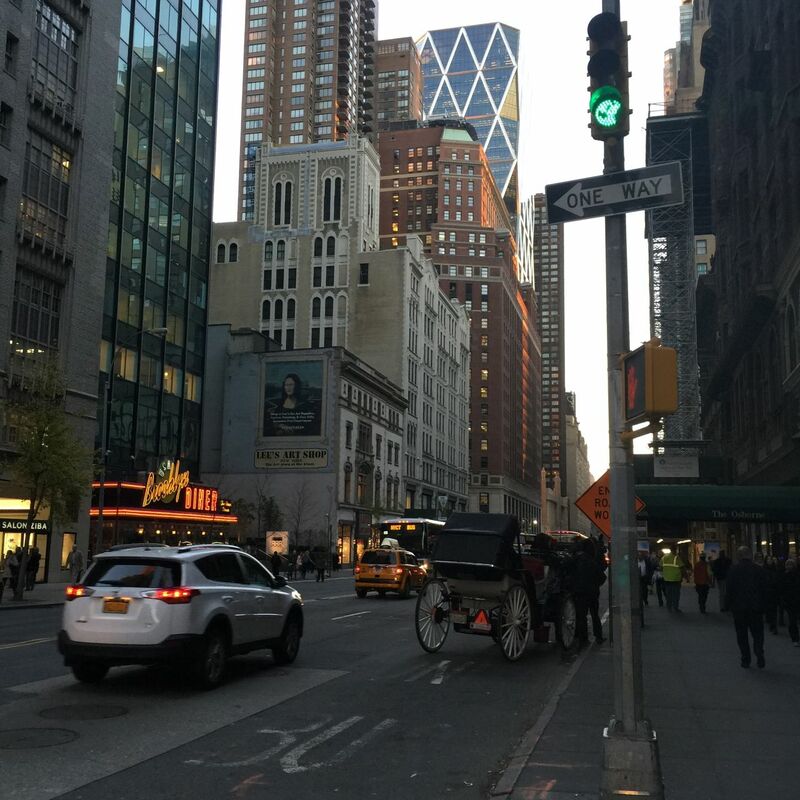 Rizzoli Books moved to the Flatiron District, and the Steinway Company showroom has closed, with plans to relocate to the first floor of the old International Center for Photography spot near Bryant Park. 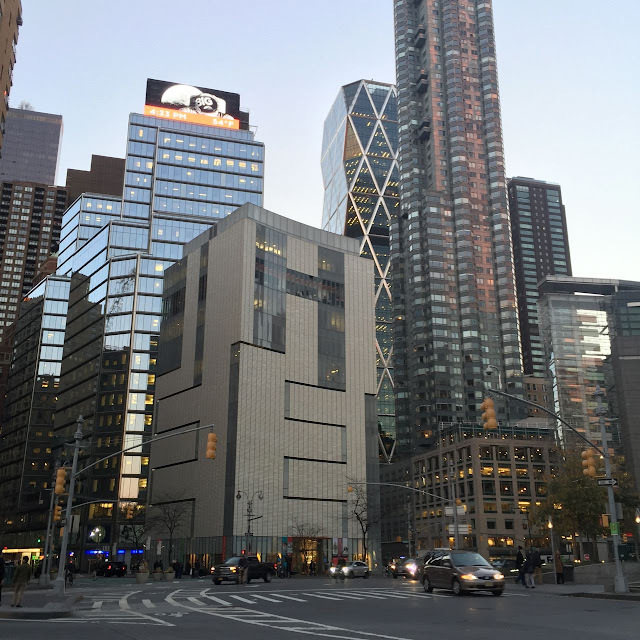 The Art Students League (215 W. 57th St.) is still here, and its galleries are open to the public. 6. 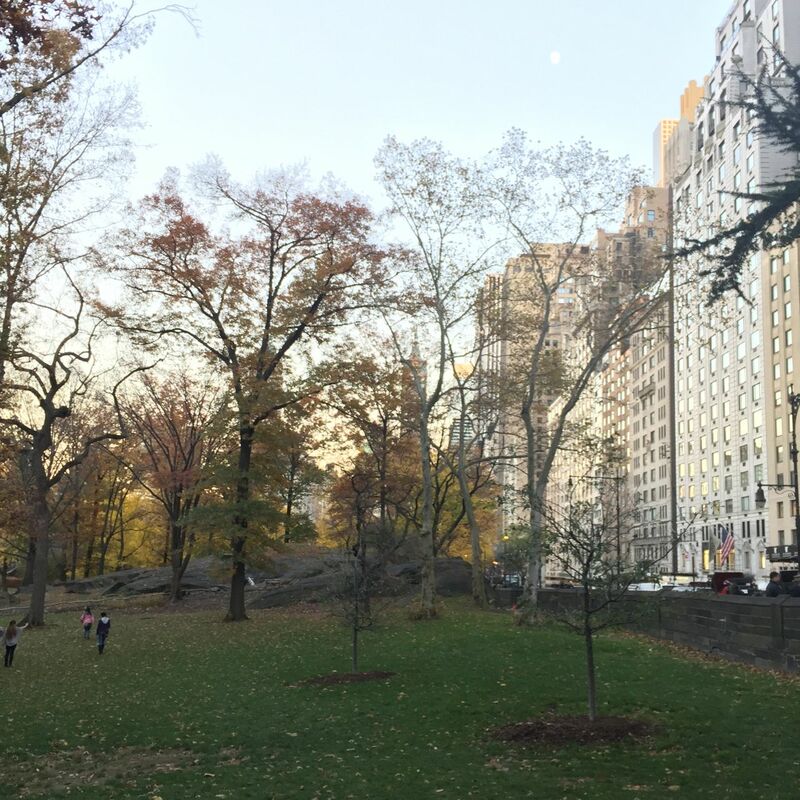 Central Park South, 59th St. between 8th Ave and 5th Ave. 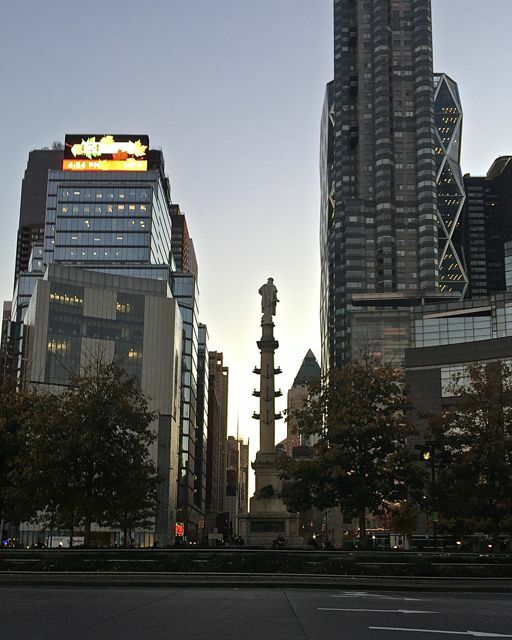 The rotary, with its monument dedicated to Christopher Columbus, serves as one of the city's main gathering points. Read about the planning for this roundabout and its innovation in traffic safety. 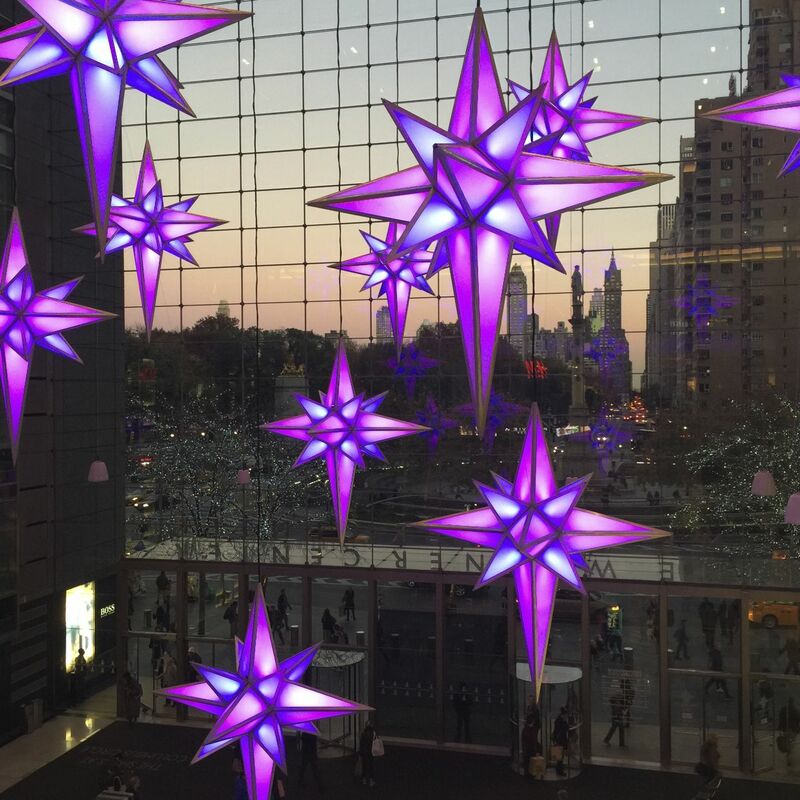 The Shops at Time Warner include a range of stores from the affordable to the pricey. I always stop in the Moleskine kiosk for gift notebooks and for my go-to weekly planner. The Williams-Sonoma store on the first floor is an excellent spot to get in the mood for holiday cooking. Many New Yorkers head straight downstairs to buy groceries at Whole Foods. I've seen many visitors there also, looking puzzled at our anxious behavior in the check-out line. 10. 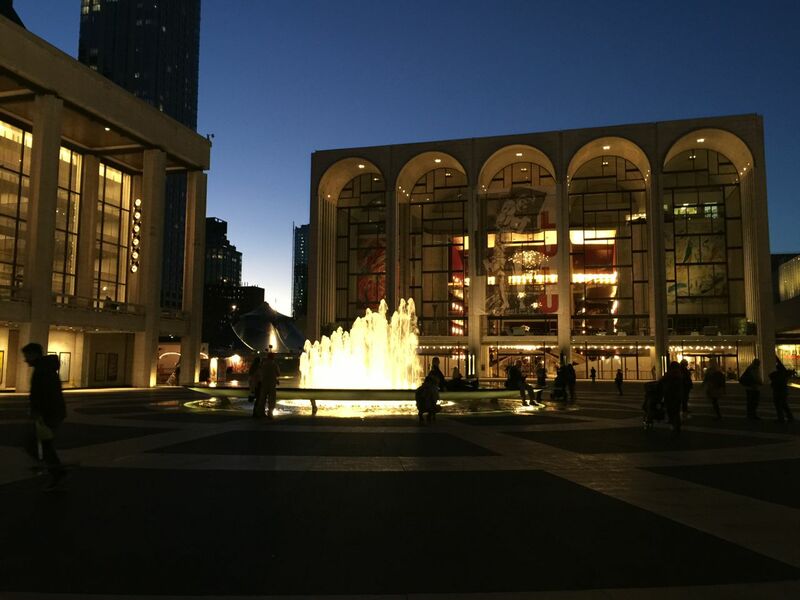 Lincoln Center for the Performing Arts, 10 Lincoln Center Plaza. Many worthy stops were left off this walk, just for the sake of brevity. You are most welcome to discover them yourself. Images by Walking Off the Big Apple from November 20, 2015.